After months of construction, we’re finally getting close to the finish line! It’s high time I shared some progress photos of the new house, don’t you think? 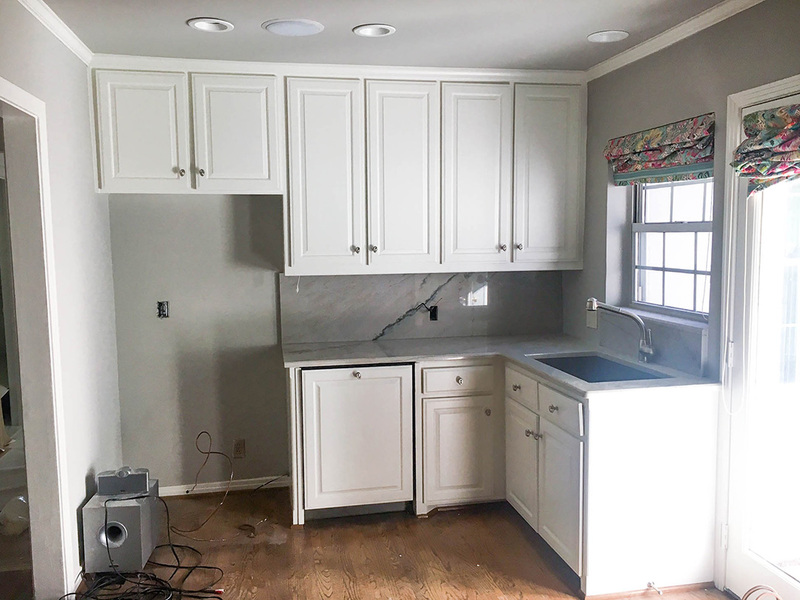 Take a look at the before photos in this post and read on to see the updates below… So many exciting changes and upgrades! 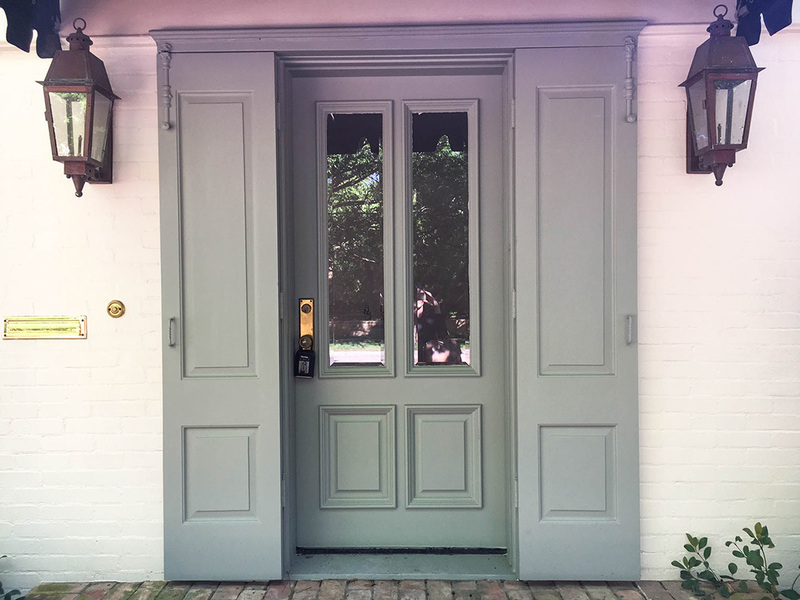 Here you’ll see the new paint job on the exterior – I chose Sherwin Williams Creamy for the exterior brick, and Benjamin Moore Woodlawn Blue for the doors and shutters. Right now the original black awning is still hanging above the door as we wait for the new matching awning fabric (Schumacher’s Cabana Stripe in Grey) to arrive. I love the new exterior colors compared to the darker, harsher originals. You can see the original beige brick and black doors/accents here. The place where I’m investing most of my money in this addition is definitely the master bathroom. 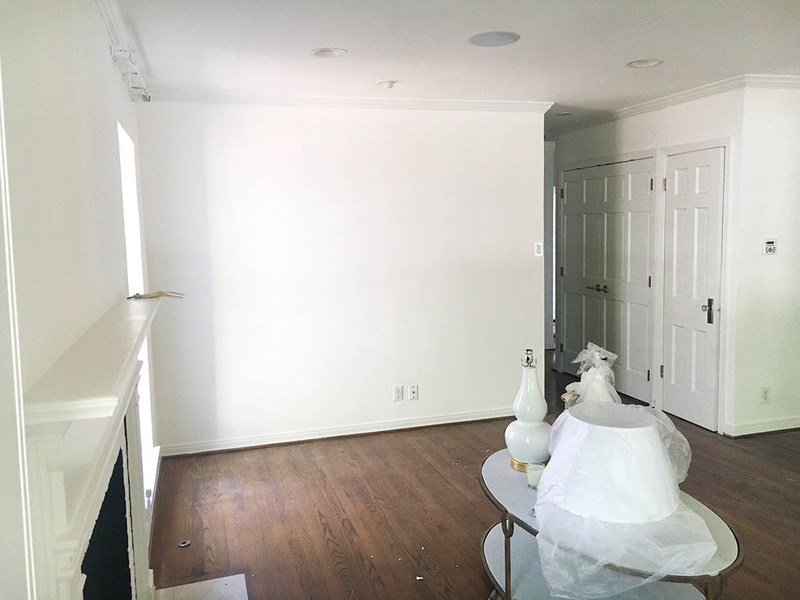 The goal for the room is to keep it very light and bright! 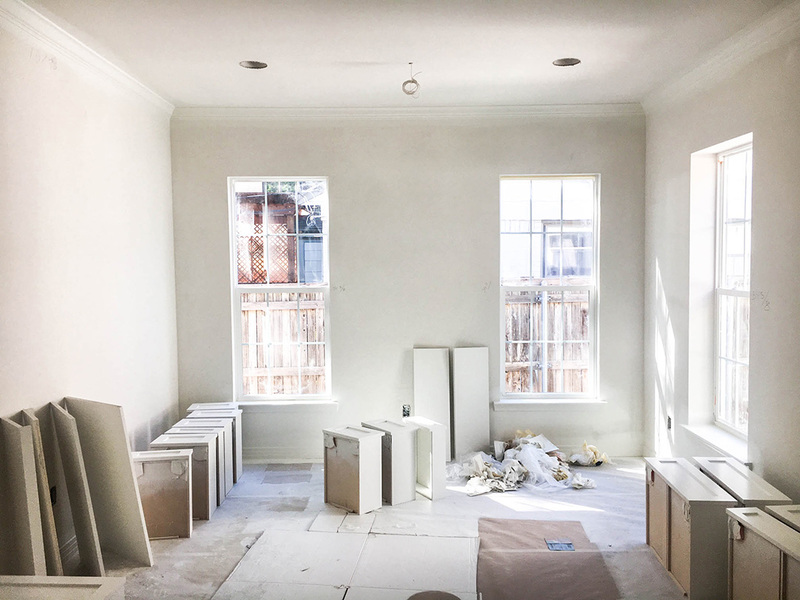 You’ve probably heard me say that a bunch, but I’m really looking forward to enjoying a lot of natural light and want to make sure I’m making the most of that with soft colors and bright white marble. 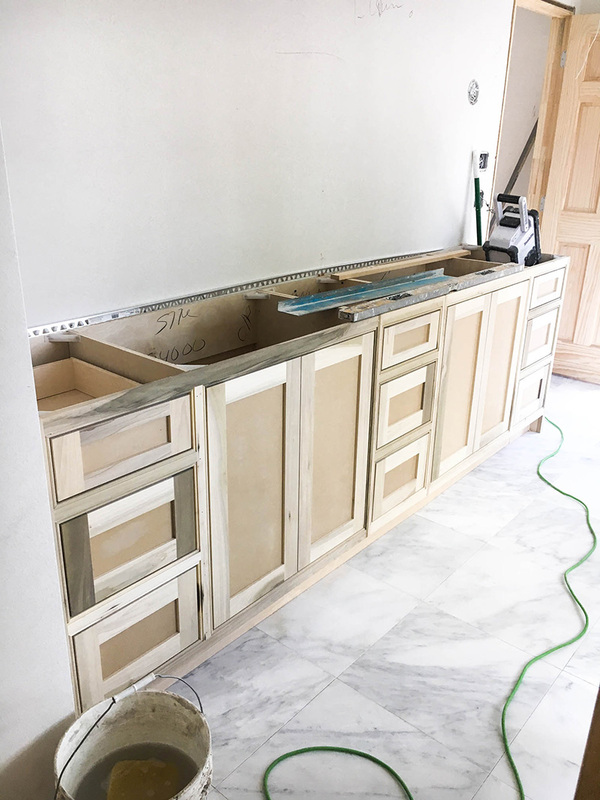 My vanity cabinets have since been painted a bright white, and the marble counters + splash will be installed in the next week or so! 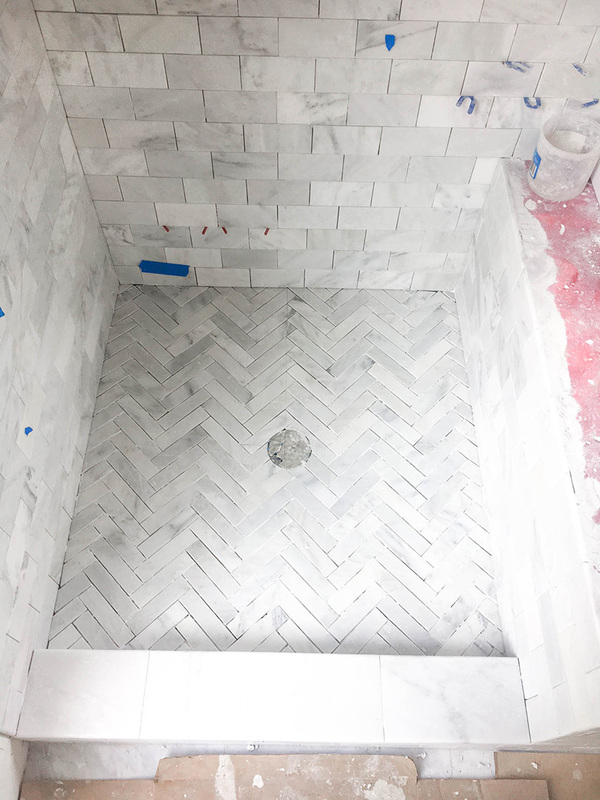 Here’s a look at the tile that was installed in the shower! I was actually out of town when it was initially installed, and came back in town to find several tiles were very dark or yellowed. Since I wanted light and bright, this was disappointing to discover. Luckily they hadn’t begun the grouting process, so I went back by when the installers came back to point out which tiles I wanted replaced with brighter pieces. After those were replaced I was much happier! 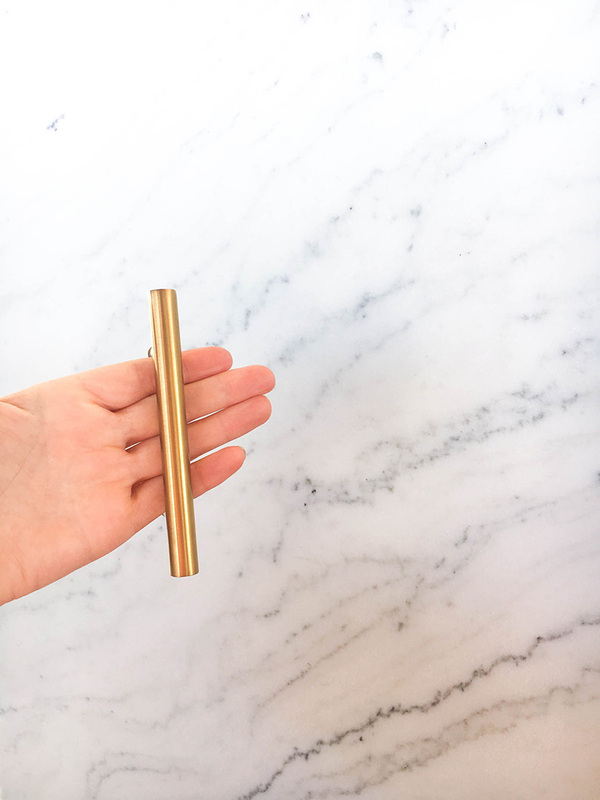 On the left is a peek at my gold bathroom hardware with the marble slabs I chose! I knew I didn’t want Carrera, simply because it all seemed a little too grey for the look I was shooting for. 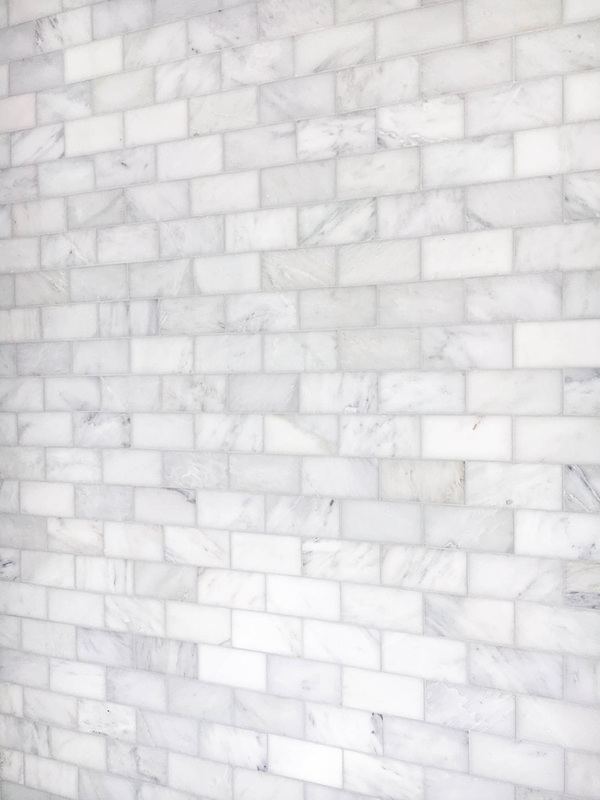 I decided on two matching Mountain White marble slabs. They are pretty bright white with subtle, thin veining throughout. I think it looks fabulous with the hardware we selected! On the right photo you’ll see one of my lamps (similar here) for the master bedroom against the paint I’ve chosen for the room: Benjamin Moore Chantilly Lace. 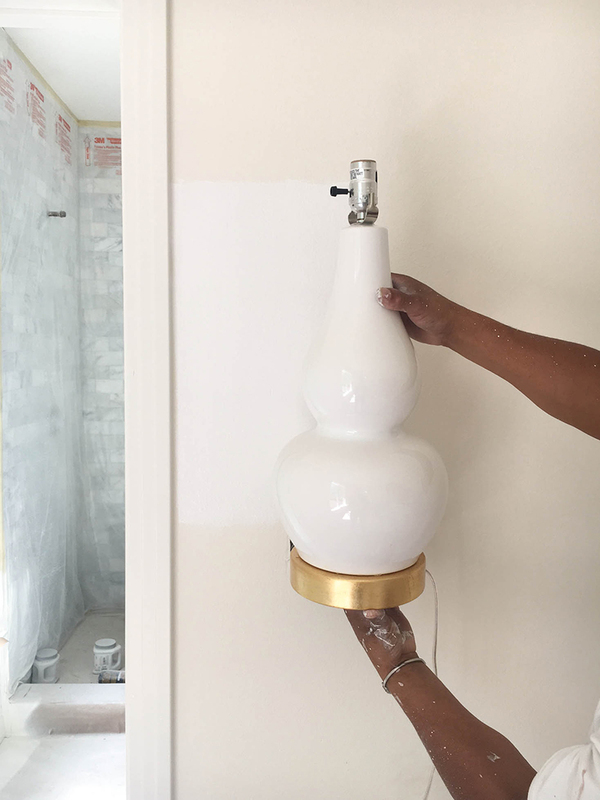 Originally we thought Benjamin Moore White Dove would work, but it ended up being way too creamy up on the wall. It almost looked yellow!! You can see the difference between Chantilly Lace and White Dove in this picture. While my bathroom is where a lot of the money is going, my closet is definitely a big focus for the new house! The house is from the 1930’s, so there’s very little storage throughout the current structure. I lack a kitchen pantry and have two small closets in the guest bedroom. 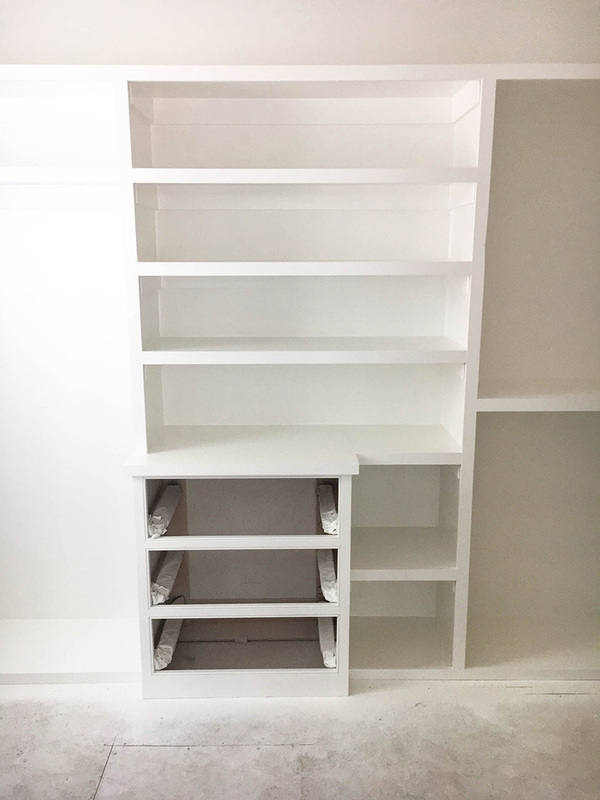 I knew I wanted a spacious and elegant master closet in the addition, and they’ve made some amazing progress on the install so far! I have double hanging on both sides for my tops, jackets, sweaters, skirts and pants, and one long hanging section for dresses and some of my lightweight coats. I’ll be putting my heavy coats in one of the guest bedroom closets, along with rain boots and other bulky items that might take up too much space in my master closet. I also asked for lots of shoe and handbag storage, and two sets of drawers for my underwear + bras, workout clothes, swimwear, socks, etc. 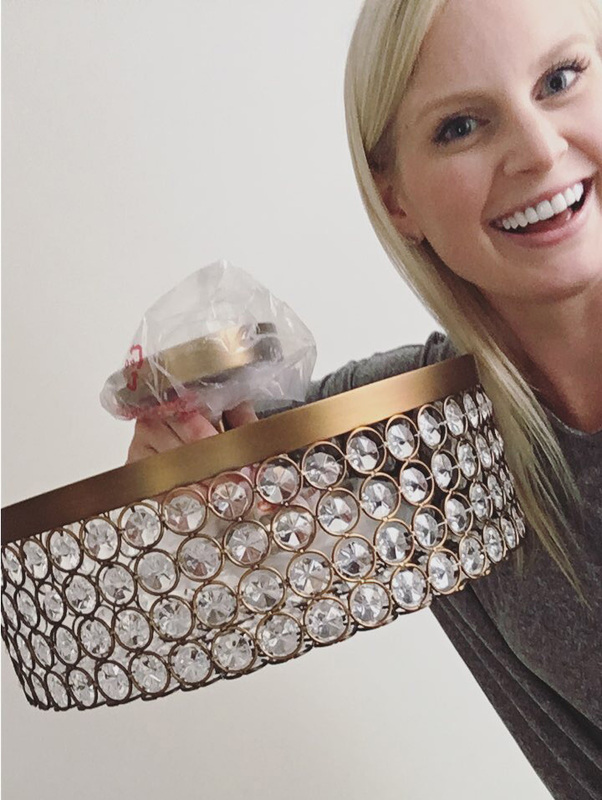 Here’s a peek at the pretty flushmount (under $200!!) 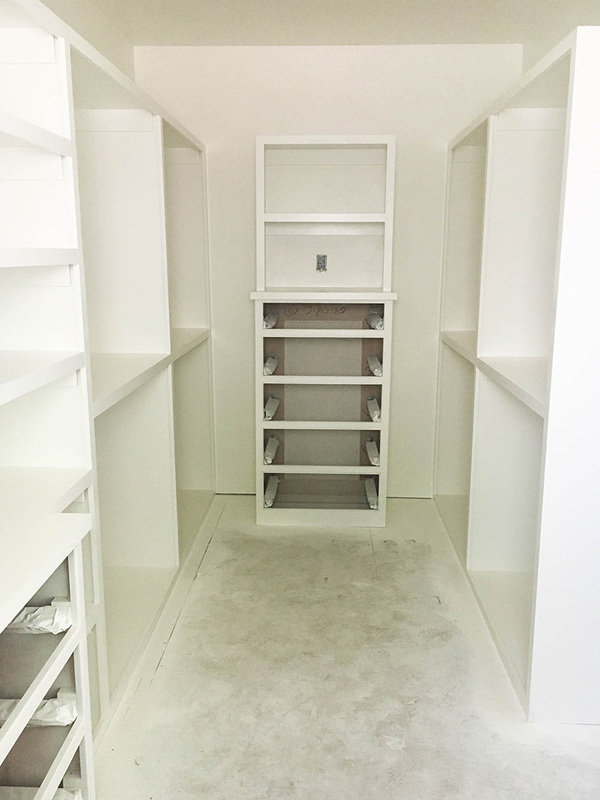 I chose for the master closet! It adds a little sparkle and ties in the gold hardware that will be on the drawers down below. 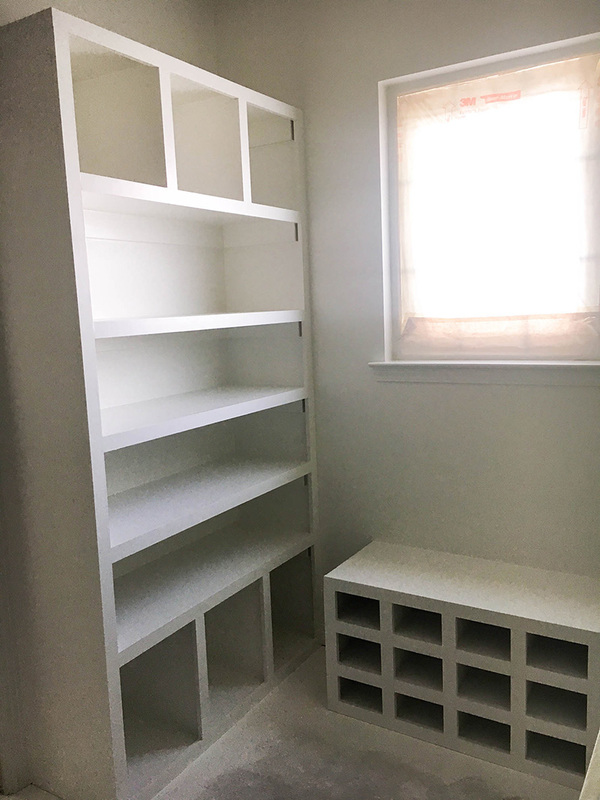 I’m also very excited about the additional two feet of storage above each section in the closet, as well as the little bench under the window (featuring shoe cubbies for my flats!) where I can sit down to put on my shoes every day. 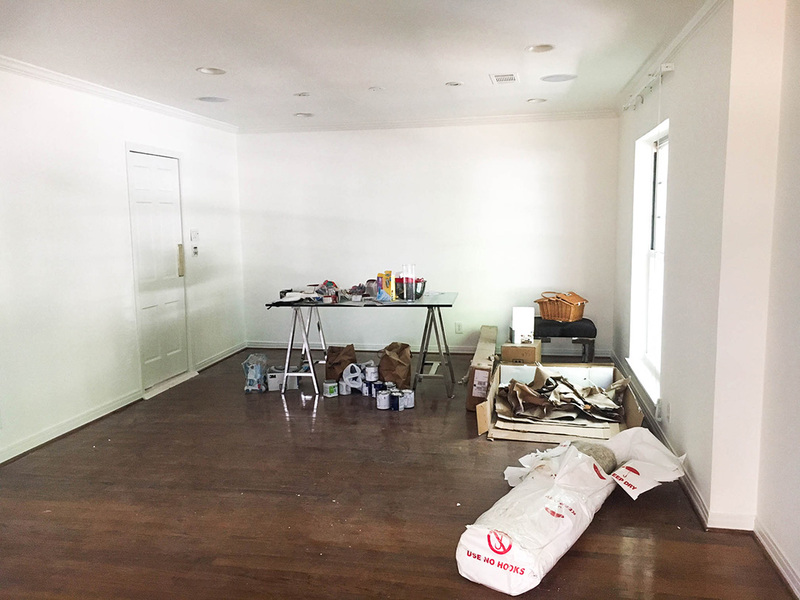 Here’s a peek of my office, both before and after the paint job! On either side of the doorways I am doing built-ins with bookshelves + large bottom cabinets. 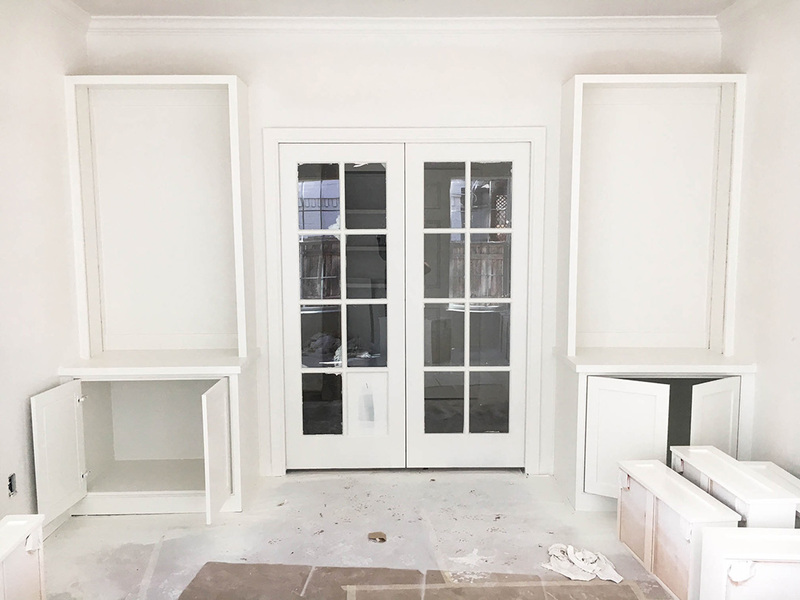 The pocket French doors were installed a couple weeks ago, and the rest of the trim was installed and painted last week! I love all the open light in this room. It’s going to be such a nice change from my current work situation at the dining table in the dimly-lit townhouse. The paint color I chose for this room is Sashay Sand by Sherwin Williams (at 75%). In the left photo, you can see the unique grasscloth fabric I’ve picked out to be installed behind the bookshelves in my office! 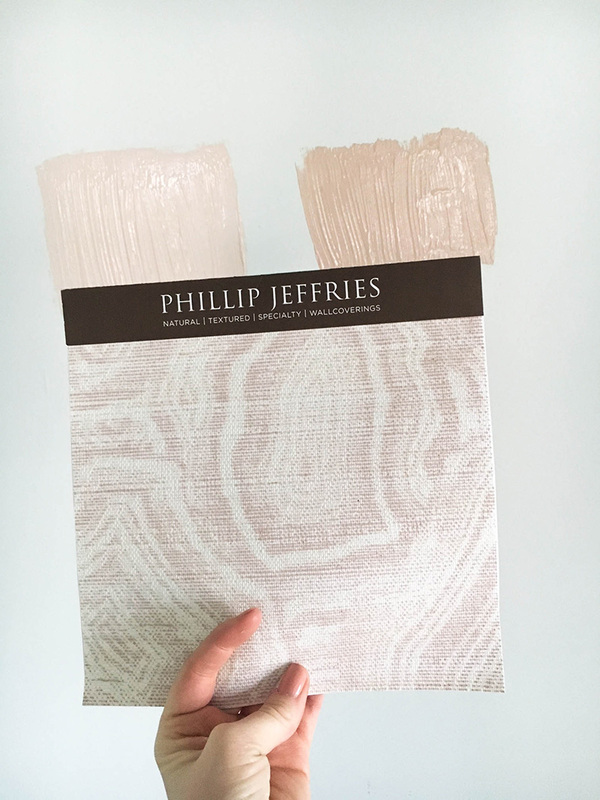 I fell in love with this subtle blush agate print when exploring the design center with Maddie. Luckily I’d already decided I wanted a blush office! On the right you’ll see my mantle in the living room which has been repainted to match the new white walls. Please excuse the awful mess in my living + dining space at the moment! The only change I’ve made in these rooms is a new paint job. 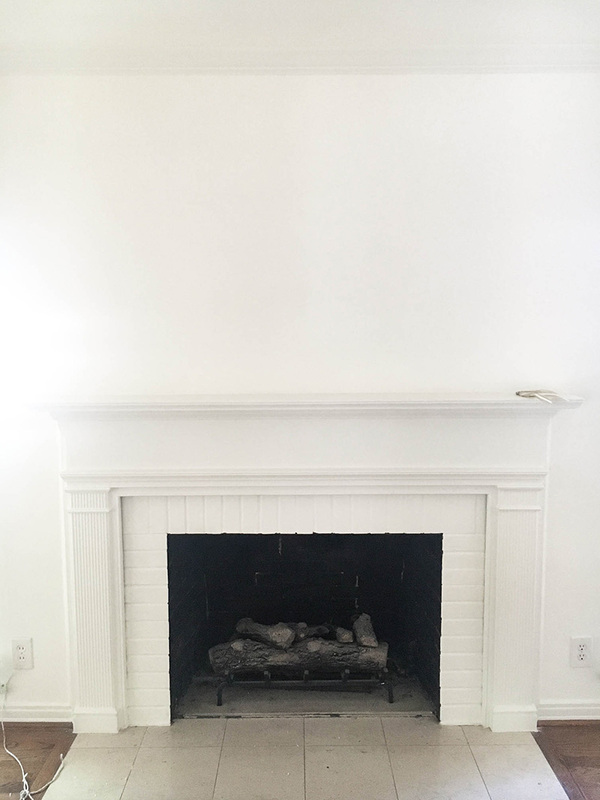 I chose White Gallery for the walls and Benjamin Moore White Dove for the trim and doors. 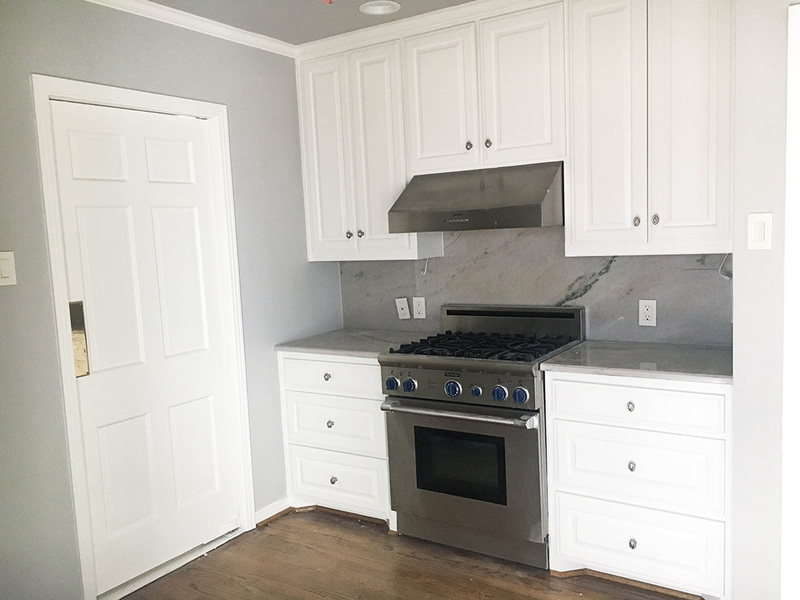 For the kitchen, the only update I made was to repaint the cabinets to match the trim in Benjamin Moore White Dove, and paint the walls to better match the existed marble countertops and backsplash. This room was the original master bedroom in the existing structure of the house, complete with built-ins, one set of bookshelves (out of view) and two small closets. I will be using this space as my guest room, and will be utilizing all of my old apartment bedroom furniture in this room. The only update I made to this room was a new paint job! 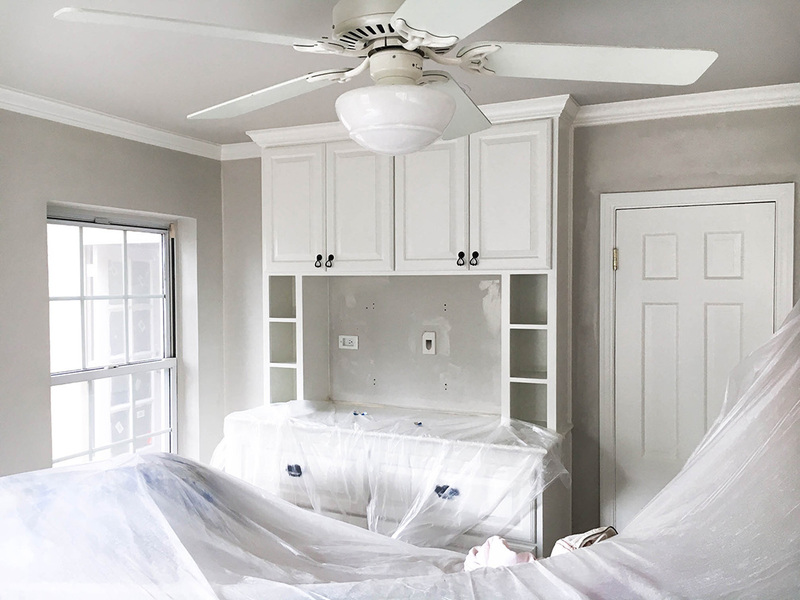 The trim is Benjamin Moore White Dove and the wall/ceiling paint is Sherwin Williams Agreeable Gray. I think it turned out very nicely! Clean and bright. I hope you all enjoyed this house update, and I can’t wait to share even more with you once it’s completed! We’re only weeks away, and then the real fun starts… DECORATING! It already looks so good, can’t wait to see more soon! Love this update! So glad you included all the paint colors. Super helpful. This is so exciting! I love seeing the updates. Your home is coming together beautifully. It looks great! I can’t wait to see it finished. I love light and bright!!! Oh my gosh, Merritt! Love how it’s all coming together! 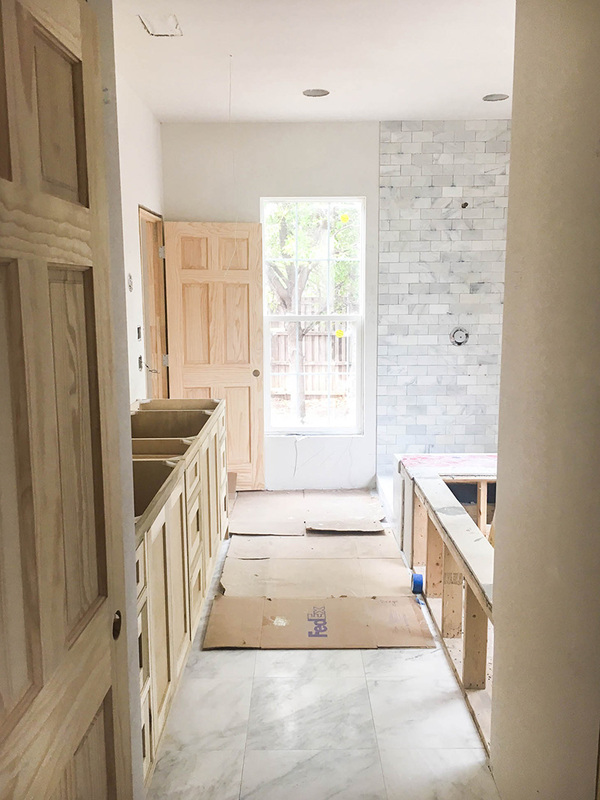 I have LOVED following along on your reno!! So fun and it looks like it’s going to be amazing!! We will be jumping into a renovation when we move back to California at the end of the year and I’m so excited! You’ve given me so much inspiration! sooo pretty! 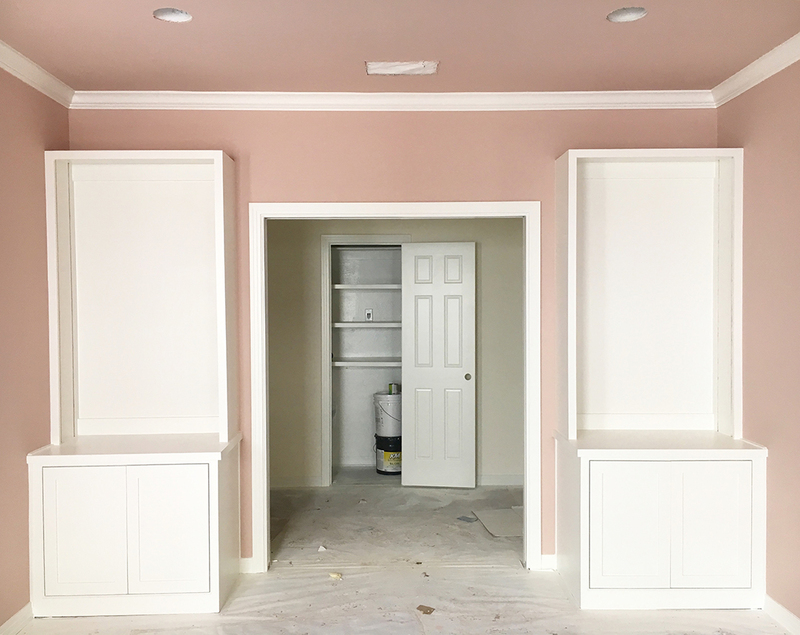 love the flush mount for your closet and the blush in your office. can’t wait to see everything finished! you have totally an opposite style from me (i’m ALL about bright colors and basically own no neutrals, hahaha). but i love seeing how you put it all together! it’s so crisp and clean looking.